In an effort to speed the design and development of an artificial retina that could potentially help millions of people blinded by retinal diseases, five Department of Energy (DOE) national laboratories, a private company, and three universities'including UC Santa Cruz'have signed agreements to form a research partnership. 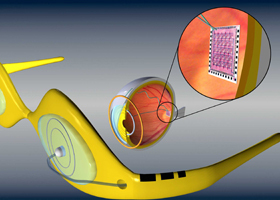 The Energy Department's Office of Science plans to fund the artificial retina project at $20 million over the next three years. Wentai Liu, professor of electrical engineering, leads UCSC's participation in this project. Liu has been working for more than a decade on the artificial retina, which could help those blinded by age-related macular degeneration or retinitis pigmentosa. In these diseases, neural wiring from the eye to brain is intact, but the eyes lack photoreceptor activity. To date, six volunteers have received implants of a microelectronic device that rests on the surface of the retina to perform the function of normal photoreceptive cells.